CJC-1295 is a peptide hormone that has similar functions to other growth hormones like GHRH. ConjuChem Biotechnology Company was the inventor of this steroid, which has proven greatly beneficial for athletes and bodybuilders with its anabolic effects on the human body. It can stay in the system for several days and stimulates the releasing of growth hormones, significantly. CJC-1295 cannot increase the HGH levels directly like HGH steroid dose, by it enhances the natural stimulation by adding its effects with HGH. The original version of CJC-1295 was GRF 1-29, which has a half lifecycle of 30 minutes. Soon, more and more improvements in the GRF 1-29 occurred, which resulted in Mod GRF 1029. This modified version had a better lifecycle and increased stability. The growth hormone secretion ability is found in the 29 amino acids chain. Both GRF 1-29 and Mod GRF 1-29 required frequent dosing, which leads to the creation of CJC-1295, which was even more stable. The CJC-1295 mimics the effects of GHRP, which is a naturally occurring hormone in human body. CJC-1295 consist of a long chain of 29 amino acids, and unlike the natural GHRP, Drug Affinity Complex (DAC) is also added to the compound. In the absence of DAC, the mimicking ability of CJC-1295 will not come into action. This steroid acts on the pituitary gland and keeps it stimulated for the release of growth hormone in a pulse. The addition of DAC technology enables CJC-1295 to bind correctly with any circulating albumin. CJC-1295 reactive group bind in a bioconjugate manner to the peptides, and these peptides than form a firmer bond by connecting with a nucleophilic unit. CJC-1295 is a form of synthetic GHRH, and like all GHRH steroids, the results of CJC-1295 will also be slow by steady. By maintaining exercise routine and calorie intake, the results will be revolutionary for bodybuilders and athletes. The effects of CJC-1295 are extensive, but the primary benefit of CJC-1295 is achieved by increasing the HGH levels in the body. The increase in HGH levels can also lead to an increase in IGF-1 levels, which affect almost every cell and major organ in a human body. From bone, muscles, to skin and central nervous system, IGF-1 has a positive effect on all! One can use CJC-1295 for performance enhancement, and quicker fat loss is also another primary effect of this growth hormone stimulator. For athletes looking to maintain their stamina and physique in the off-season can benefit greatly from this steroid, on a condition that it is combined with other anabolic steroids. Alone, it can do very little for bodybuilders and athletes looking to pack on more size. Even though it has the power of increasing the anabolic activity in the body on its own, the change will not be significant enough to make a change. Another effect of CJC-1295 is the increase in metabolic rate, which will help you to stay leaner and fit during the off-season. The weight loss is subjected to a condition – when you control your diet and stay on the healthy path. For the cutting stage, users can find their weight loss accelerated and also helps in the healing process. As the recovery process slows down due to calorie restrictions and with CJC-1295, the process can come it its ideal pace. The side effects of using CJC-1295 are rare, but they do exist, like any other anabolic steroid. The dose quantity and genetics are also a big deciding factor for the side effects, and can be easily controlled with workouts and managed diet. The most common side effect of using CJC-1295 is irritation around the injected area, which is rare and can be controlled by changing the site of injection. Water retention is also considered as a side effect along with headaches. By reducing the dose or altering the intake period, this can be easily managed. Also, by making diet adjustment the weakness in the body can completely vanish, and hence the side effect of CJC-1295 are not that great. As CJC-1295 is a water based steroid, there is a certain precaution that one must take to avoid any side effect in the system. The regular dose of CJC-1295 is 1mg and can go up to 5mg, depending upon your requirements. The dry CJC-1295 powder should only be mixed with bacteriostatic water, to avoid chances of infection. The injections should preferably be done intramuscularly and twice a week doses are considered optimum, to maintain its desired levels in the bloodstream. 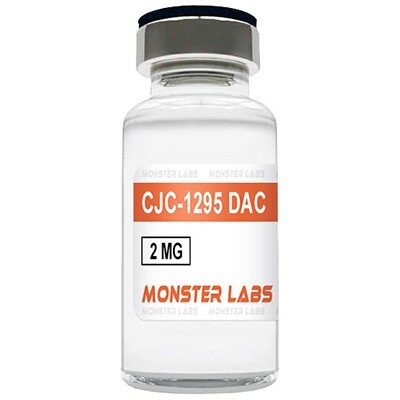 CJC-1295 is a readily available from companies that conduct research for its medical use. Even though CJC-1295 is not considered a controlled substance in the US, but individual purchase outside of research purposes is illegal. You can also look for CJC-1295 on the black market, which is available through almost every anabolic steroid seller.